Traveling with your pet to Savannah easy. Two of our properties are pet-friendly, and will welcome your four-legged companions with lots of love and a special treat. There are lots of outdoor activities and dog-friendly attractions here. Check out East Bay Inn and Olde Harbour Inn for a beautiful historic hotel where you can bring your pet. With its spacious suites, Olde Harbour Inn is a great choice for you and your dog. Each door opens to the outside, making those quick outside trips easy! A one-time $50 pet fee covers up to two pets in one room for your entire stay. Savannah's the perfect place to walk your dog. 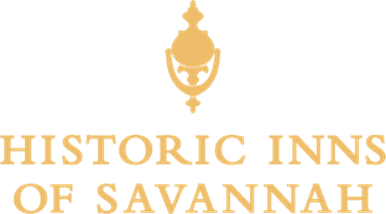 With 22 parks and squares, Savannah’s downtown area is one of the largest National Historic Landmark Districts in the US. It's a great place to to walk, and you’ll definitely find lots of “like-minded” dog owners out enjoying the city every day. Generally, any walking route you choose will give you a feel for this beautiful city, but we do recommend a visit to Troup Square, known as "Dog Bone Square," for a romp with your pup. Take note of the convenient doggie waste receptacles Savannah has installed. Most of the downtown squares have an in-ground waste receptacle, noted by a green metal lid with a white stencil of a dog on it. You just open it by pressing a pedal with your foot, and you can dispose of whatever your dog left behind and continue on your walk. Doggie water fountains positioned at nose level for your dog are in Forsyth Park, Troup Square, and Ellis Square. Most walking tours are pet-friendly, including favorites like Savannah Dan, a familiar seersucker-clad guide who gives 90-minute walks through the historic district. We recommend Old Savannah Tours for a trolley tour if your dog prefers to ride. But perhaps the most dog-centric tour you’ll find in Savannah is Oliver Bentley’s Historic Dog Walk Tour. This is a history tour that’s all about your four-legged friend and includes a walk-about-bag of gluten-free healthy dog treats for the tour. If you think you’ll be eating take-out in your hotel room for every meal just because you brought your dog, think again! Savannah’s become quite the town for foodies over the past few years. Combine our love for food with our affection for dogs, and you’ve got a winning combination for pet-friendly restaurants. Of course, dogs aren’t allowed to dine indoors, but that’s what the outdoor tables are for! In fact, any time you see an outdoor table, you can almost guarantee your dog will be welcome. If your pup prefers shopping for high-end apparel, toys and snacks for himself, we recommend Woof Gang Bakery. There are three locations in downtown Savannah: in City Market, on Drayton Street, and on River Street. You’ll find treats, dog toys, leashes, collars and accessories galore inside. And Oliver Bentley’s isn’t just for tours. They sell treats and gifts for dogs and their humans in their Wright Square storefront. (Locations on following map). The City of Savannah's Leash Law requires that all pets be leashed when visiting City parks, squares, business and residential areas. In addition to keeping your pet on a leash, Savannah also requires pet owners to "scoop" up after their pets.